School is just about out for the summer, and the age-old question comes back to all of us parents: how do we keep the kids entertained without busting our wallet? The pools and parks are great, but sometimes it's just too darn hot to be outside. Then what? AMF has the answer this summer - the AMF Summer Unplugged program. Kids 16 and under can receive 2 FREE games of bowling every day from Memorial Day to Labor day. Wow! Visit this link to find a participating AMF location near you and sign up! Program is good for two FREE games of bowling each day for kids 16 and under (does not include shoe rental). Free games must be played during open bowling before 8pm. Coupons will be emailed to you each Sunday for the upcoming week. The drippy faucet, the clogged shower drain, the humming garbage disposal, and the consistently running toilet. For decades, these are problems that have plagued stay-at-home-moms and housewives everywhere. When I was still working full-time, the little problems around the house didn't really bother me all that much, mostly because I wasn't around all the time to notice them. But the stay-at-home mom gets irritated by the little things easily - we all know that! I knew it wasn't fair to ask my husband to fix things. In the little time he has at home (he works full-time and is also going to school for his MBA) he needs to be relaxing and enjoying time with his daughter. I also knew that we don't have the money to call out a handy-man every time that we have a little problem at home. With a little research and a simple tool set, I decided that I could at least attempt to solve promblems for myself. Shopping with a toddler. As any mom well knows, you can barely get into the store without a sympathetic look from a woman shopping kid-free, or a better-you-than-me stare from a middle aged man. We all know it. Shopping with a toddler is not easy. With AJ, shopping really has no middle ground. She's usually either fantastic, or a little devil. No in between. 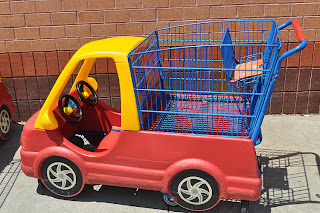 And then one day as we went to the grocery store to pick up a few items, she spotted the pimped out shopping cart. She knew exactly what it was for, and climbed right on in. Part shopping cart, part toddler dream - AJ was so happy to be driving and steering her way down the aisles of our local grocery store. "Beep, beep!" she would exclaim as she pounded on the horn. As a pastor, Max Lucado received a lot of questions. Difficult, the answer might change your life kind of questions. In his book, Max on Life, he attempts to answer 172 of the "tough questions" that Christians face these days. More than a few of them are the kind of questions that I'm sure you've pondered, but would never have the courage to ask a person of religious authority. Max doesn't promise to know all the answers, but he does direct each question to guidance in the scripture as well as using real life examples. It's Friday, and I'm trying to get back into the swing of answering one of the 50 Questions That Will Free Your Mind each week. The difficulty is that the questions seem to be getting more and more difficult. :) That's kind of how life goes though, isn't it? Newborns come into this world knowing nothing at all. As parents, it's our responsibility to mold them into upstanding citizens and guide them in the ways of life. It's not easy. Nobody ever claims that it is; the fact is that once you're a parent, you'll always be a parent for the remainder or both yours and the child's life. Tithing by Douglas Leblanc is part of The Ancient Practices Series. If you're a Christian looking for information on tithing, this is the book for you. It's relatively short, consise, and unjudging. Tithing is the act of giving 1/10th, or 10%. This means different things for different people. For some it means giving 10% to their church, for others it means giving 10% to those in need. The tithe has long been a debate in the Christian community, and Leblanc does his best in this book to share the stories of 11 Christian and Jewish families and their personal takes on tithing. I love BabyLegs in the Spring. There isn't anything more practical and reliable for those little legs on chilly mornings and cool evenings, when the day between is warm. Just carry them along in your diaper bag and use them as needed. There's no better way to add style to your toddler's wardrobe! (And as my BabyLegsdrawer can attest... we're big fans in our household.) 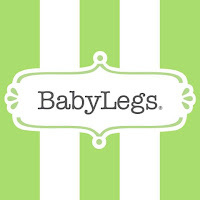 I was thrilled to review some of BabyLegs Spring Line, and you better believe I've got another giveaway for you - a BabyLegs Grab Bag worth $50!